I’m starting a summer lip series, featuring some of my very favorites in different categories. Today is my favorite bright pink lippies. 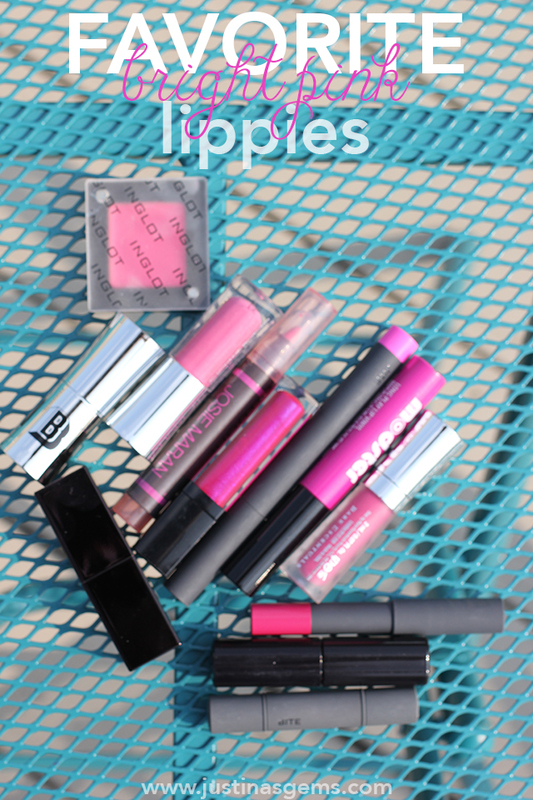 I’ve got both glosses and lipsticks, but what they all have in common is being BRIGHT PINK! I love this shade and I love my choices. If you have a favorite, I’d love to hear about it in the comments below. Armour Grace: This gloss is a deep magenta with blue shimmer that has tons of pigment. It’s thick and pretty sticky but the color is going nowhere once it’s on your lips! I don’t wear this nearly as often as I should and when I was digging around for colors to feature I was so excited to re-find this! Buxom Exhibitionist: I am a huge fan of Buxom’s Full Bodied Lipsticks and you can check out my review here of a couple of my favorites. The texture and color represented in Exhibitionist are perfection! Ardency Inn Club Remix: This is a new favorite brand of mine and the neon pink shade is amazing. You can read my review here. Buxom Strut It: This shade came in the Nudes and Brights kit which I bought, took pics of, and never ended up reviewing! I love all Buxom gloss because it’s so creamy and shiny and has a tingly, plumping effect. Bite Quince: This is a bright rose berry shade and you can read my review here. I have this in a High Pigment Pencil, but I believe you can also get it in a lipstick. It’s coming off a bit more red in pictures than in real life! Bite Satsuma: This is a fuschia pink shade in Matte Créme Lip Crayon form that I’m obsessed with and you can read my review here. Shiseido V1418: This gloss is berry, bright, and totally wearable for every day all at the same time. Buxom Berry Blast: This may have also come in that Nudes and Brights Kit. I can’t remember! I love this shade and it often can be found in my purse because I wear it all the time! Inglot Freedom Lipstick Matte 518: This looks much brighter on the lips than is translating in a swatch. You can read my review here. This is a fun lippie to wear by itself, topped with a gloss, or in an ombre lip look! Josie Maran Jitterbug: These stains come in several colors, but don’t stock up on too many because they dry out in a few months. The applicator is felt tip. I love these while they last! Jitterbug is my favorite shade of the bunch. I love the bright pink stain it leaves on my lips! Bite Palomino: To end with a bang, Palomino is a vibrant magenta. I have this in a dual ended Luminous Créme Lipstick that also comes with the shade Violet. I love how vivacious this shade is. I feel daring when I wear it! Which is your favorite? Shop below! I’m obsessed with pink lippies! Great picks – that Armour Beautuly is a fav of mine as well! Ardency Inn is a stand out to me! What a great collection! I need to try some of those Bite Beauty lippies. LOVE Bite Palomino– it came in one of the duos I have. Love this series idea! You have some amazing lippies. That Buxom looks stunning. Really pretty! I love a good bright lip! Those are all so pretty ! So many gorgeous bright pinks… I love it! Great picks! Ardency Inn Club Remix looks especially pretty. I love bright pinks! Great choices! I would love to try the Bite shades and the Inglot since I haven’t tried either of those two brands yet. And I love pink! 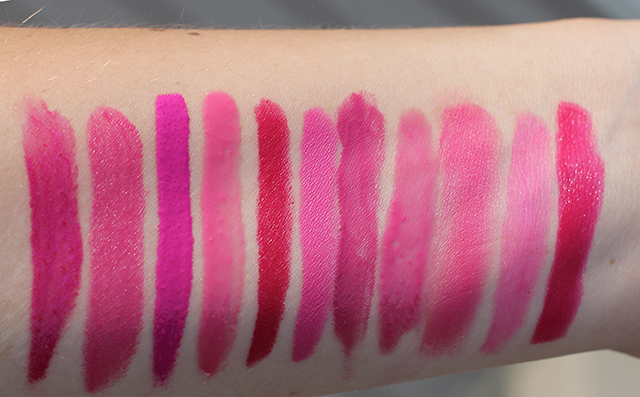 glad to know I am not the only bright pink lippie addict. OMG, this post is the best thing ever. I may have wanted to lick your arm. I really like pink. I love a good pink lip and you have some great choices! SO pretty! I love your shots too- & that Bite is calling my name!